Alan came in from Reno for a 3 day fly fishing marathon angling experience in Tennessee and Alabama. Alan called and we set up his trip for 3 days of fly fishing and fun. We sent Alan to the Caney for 2 days and onto Smith Lake for his 3rd day. We started early on nymphs and within a few casts Alan pulled the first rainbow to the net. This was a glimpse into the remainder of the day as the rainbows were "on". Alan was dialed into his casting and real close on mending. He started off hot on the nymphs as the sun came up over the trees. We fished the nymph hard and it produced. As the sun warmed the water we went to the top and tied on a terrestrial. We fished the top just as hard and only found one fish willing to eat up their. We discussed the options and made a decision to fish nymphs through the better runs. The wildlife came out front and center for this float. We were able to get photos of some wildlife, but not all that was out on this float. So as we fished along and watched the different animals the day was coming around to "our way of thinking". We went back to the nymphs and right away the rainbows came back to the offering. The fish were responding well, we were getting good drifts and good hooksets, so the plan was coming around. Some places on the river are my favorite. We drifted into a run where I have seen countless anglers lose fish, including myself. We slowed down and tried to have everything just right. On this day we slipped in the run and began our trip down the edge. Alan dropped the bug in a slot and threw a mend just right. We slowed down the drift and the boat and a nice fish flashed, then Alan set. All I have to say is we boated that fish! We would repeat this routine over the next couple hours. Every good spot in the river would produce a strong pulling rainbow. The browns must have ate their meals before we arrived and were not hungry, but the bows really filled in those gaps. We stopped for lunch in the shade and set up the table in the middle of the drifter. This was something I have done a couple times and it speeds up our lunch to give more time with flies in the water. After lunch we rowed into one of the last good runs of the day. Alan was set up to pull a fish from the head of the run in a hole about the size of a garbage can lid. He got the fly in early, the fly settled an then floated into the hole. The fish ate right away and the rod raised then the line came tight. We got that fish to the net and we went right back to the hole which again produced the same result. Then we went back for the 3rd time and were boating another fish before the end of that drift. It is a small hole, but one I can never pass up again. We finished our day on streamers to prime Alan for his next day of warmwatert fishing. It was one of the better days of fishing over the past several floats. The wildlife, the responding fish and a good meal with a very good angler. The last time I saw Alan he was driving toward I-65 for his next stop on his Fall trip to the southern states. I had the privilege of spending a fantastic Fall day on the water with Marc and Mary. The wildlife was out and about. It is that time of year where the geese are flying, the squirrels are gathering and the browns are starting to get their spawning colors. The skies seem to be a little more clear and the waders are beginning to make it into the truck so we have them for early morning warmth when we launch. Mary was on the trip to enjoy the day and perhaps catch some fish. Marc was the angler looking to enjoy the fish on the line and the tug it provides. We shoved off hoping the river would give up some fish and an enjoyable, yet rain-free day. The fish responded and were in the usual places. They wouldn't bite if the drift was not almost perfect, so we had some work to do. Some days the drift can be a bit on the sloppy side but this day wasn't one of those days. Marc worked on his drift and after a few adjustments to his technique he was dialed-in and well on his way to a great day catching fish. With all the morning action we floated into the usual lunch spot and fired up the grill. Marc and Mary enjoyed a lunch of cedar plank grilled salmon, one of my favorite river-side meals. We sat next to river for a while and the day slowed down a little more. After lunch we shoved the boat off the gravel bar and Mary decided she would fish for a bit. We rigged her rod with the appropriate nymph, then in 10 short minutes she had gotten a good drift, with solid hooksets and boated her first 2 fish on the fly rod. I didn't get a good photo of Mary while she was fighting her fish, but I did get an awesome shot of the rod, which is above and a photo of the fish which is featured below. Mark continued with a solid day on the river. The river gave up good numbers on this day. We worked a little harder on this trip than on some previous trips but it was worth the extra effort. The drift was of utmost importance. Getting the bug to float at the same speed as the flow of the water, by using upstream and downstream mends, meant constant adjustment. To achieve that drift we used mostly leaves to pace the fly on this fantastic Fall day. To see the latest fishing report click here and for more booking information see our Home page. If you are a seasoned angler or have never picked up a fly rod and want to set up a day on the river just email or call/text 615-796-5143 to book a day on the water. The last couple months have been nice with lots of opportunity on the river and anglers enjoying themselves in the casting braces. Elton and David fished with us in 2012 and came back again to enjoy the river. This time we had some awesome weather and the fish were responsive too. The guys went to work with the nymphs and the fish responded in likely fashion. Elton didn't waste any time whatsoever and brought a brook trout to the net while I was still rowing off the ramp. Both anglers had the slam within 30 minutes and we settled in to a nymph for David and a terrestrial Elton. Traffic on the river was normal for this weekend float and we continually fell behind the other watercraft, waiting for the best water when we had to wait. The guys settled into a routine of casting, mending, then catching. Elton tossed the terrestrial pattern into a seam that will normally produce and a nice rainbow rose to the fly, then ate. Elton came tight and the battle was quick and decisive. David continued on nymphs getting some good fish here and there. David was getting a clean drift and the fish were eating subsurface. David was working between gravel bars and got strong take from a pretty good fish. During the fight Elton and I schooled David on the size of the fish. We said it was a good fish while David argued it was just stocker size. The fish came to the net and it was about the size Elton and I were describing. To all of our surprise it was also a brook trout. David had just set the hook and brought the largest brook trout we have caught all year to the net. Bill must have decided he had a good time on the last float and he returned this time with BT. We shoved off for some afternoon fishing and hopefully a good terrestrial bite. The first order of the day was to get tuned-up with some casting, mending and hook sets on a reliable nymph pattern. That nymph was good to us and we put a good number of fish in the net with the dead drift. We hit all the likely places including runs, riffles, blow downs and the better slow parts of the float. Bill boated several fish early in the float including a really nice brookie with big spots and an even bigger attitude. BT had been away from the fly rod for a couple years but quickly made up for lost time. He was back to casting and mending in a hurry and was also quick to get on the terrestrial patterns too. BT was into good fish on top in the first few minutes. He also listened well and tried to get the bugs to land just right on the water. The wildlife has been out and about over the past few weeks. Fall is in the air and now has been labeled on the calendar as well. The brook trout and brown trout are beginning get their colors and before we know it Winter will be on Middle Tennessee. BT tossed that terrestrial over and over. Cast, let it rest, twitch, twitch, rest, then cast again. over and over. After we saw a rise he tossed it on the rise ring, rest, twitch, twitch, rest, begin to cast and bang, the brown blasted off the bottom and ate hard on top. BT stayed with the fish through the many attempts it made to escape and brought the brown's head up, then into the net. After BT brought the brown to the net I asked Bill if he wanted to follow suit. Bill had memories of his last trip including his induction into the 20 + Club and elected to continue boating a good number of fish on the nymph. BT had not intentions of getting back on the nymph. Even though Bill was getting bigger numbers, BT was boating some healthy fish. We continued on and entered a good section of the river. BT lobbed the fly into the feeding lane and another nice brown exploded on the fly. The rod came up, the line came tight and BT was soon into fight with another brown. He played the fish perfectly and after a short fight we were taking the "hero shots". Then Bill was looking for the terrestrial rod. The rest of the day we continued boating fish on terrestrial patterns. The fishing on top was a bit slower than nymph fishing, but this type of fishing has been a lot of fun some years, until the first frost. We must have been having fun because others on the river could hear us for the rest of the day. It sure was a good day on the river. Already there is talk of a Spring trip and it should be interesting to see if that future trip could possibly top Bill's last two visits to the river. It has been a busy time on the FV Southeastern Fly this year and we have been fortunate to make some new friends. It was a busy Summer for Donnie as well and with some "life events" we haven't been able to get on the water. The other day he called and insisted on booking a trip because he needed some time on the water. We finally came to an agreement and set a day to float the river. Staying with the Summer theme of leave early or go late, we left early to beat the traffic. The weather was overcast and a bit on the chilly side of things when we knotted up that first nymph. Neither of us had much confidence in the store-bought fly and soon we had tied on the DP Prototype as Donnie likes to call it. The first cast immediately got a hit and Donnie's timing was there with the hook-set. We had that fish in the net and the skunk was fought back one more time. With skunk off the boat and angler we pulled up to the next likely spot and dropped the anchor. After a few casts and a darn good drift, if I do say so myself...and I just did say so myself, Donnie had a nice brown on the line and soon in the net. We took the "hero shots" and then released the brown to bite that pattern another day. Elton has fished with us several times and on this trip he brought his son David, who definitely brought along the right hat. David also brought along a cool custom rod that was about a 3 weight and each fish he caught put a good bend in the rod while providing just the right amount of fight. Elton is a member of the 20+ Club and was looking to score his second appearance on that board. Elton was into fish right away and got the skunk off the boat within the first few minutes of the trip. He added several fish to his count before David got dialed-in. But, David came back strong and before long the fish count began to swing toward his favor. We picked apart the upper part of the river catching fish in most of the usual places. We had two slams going early in the float as things settled in. There were several doubles on the day. The fish were cooperative and the guys settled in to the process of nymph fishing on the FV Southeastern Fly. The guys began "fishing", which means they began to look ahead at the next drift and plan their next moves. I watched them begin to think through their casts as well as how they would set up the next drift while working on their presentation. The late Summer colors of fish weren't the only colors we were seeing. The water has been stained this week but thankfully not chocolate milk. Some of this stain is coming out of the lake and some is coming from the feeder creeks in the upper stretches of the river. We caught fish on hoppers but they did not produce the same results as nymphs. The fog was on the water which has helped accelerate the top water strikes in the past however this day that wasn't the case. We gave the the terrestrial a fair shot, then we all agreed the nymphs were doing what we wanted and the guys were quickly back on nymphs. As soon as the nymphs hit the water the rods were bent once again. There were smiles all around on the drifter throughout the day. The day began to wind down and soon we were sliding into the takeout. This was another trip and a nice day spent on the river with another father and son. The fish were hungry for our flies and that was icing on the cake. The guys did a nice job picking apart the river and before the day was over both had brought about the same number of fish to the net. 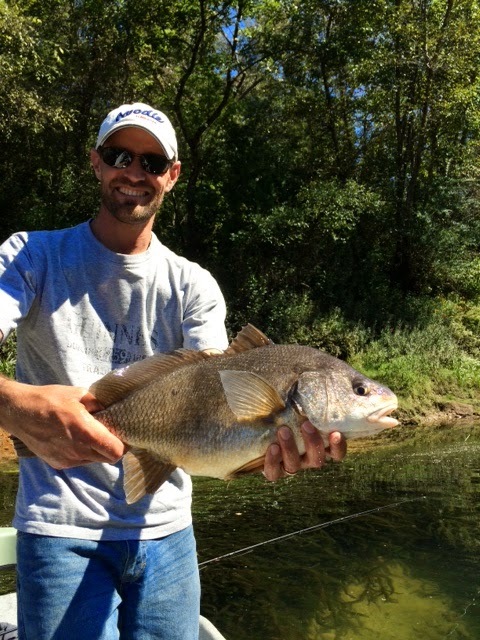 As we move toward Fall the rivers in Middle Tennessee are providing a great venue for anglers to enjoy the outdoors and to spend time with friends and family.